We are undergoing a period of strife in our country that works to tear us apart. However, there is one issue that has the potential to unite all Americans, north and south, liberal and conservative, and that is saving our beloved national landmark, the Delta Queen Steamboat. Paddlewheel steamboats helped to build this country, and the last remaining authentic overnight paddlewheeler is in danger, grounded and tied to a dock as a boutique hotel in Chattanooga. While we applaud the people in Chattanooga for caring for the vessel during this lull in her career, the boat's real work is to ply the rivers from Cincinnati to Pittsburgh, to Minneapolis-St. Paul, and all the way down the Mississippi River to New Orleans. "As the last remaining authentic, operable riverboat in the world, the Delta Queen is a valuable part of our nation's heritage that we have a duty to preserve and protect for future generations. As she makes her final stops in Point Pleasant [Ohio, Oct. 7], I urge Congress to support this effort to ensure the Delta Queen may continue to serve the people of Ohio and West Virginia for years to come." We want Move On to initiate a petition to call upon President Barack Obama to grant Delta Queen Steamboat a presidential pardon, thus allowing her to traverse the Western River System as she has since 1947. The survival of the Delta Queen is as important to our national identity as the Statue of LIberty, the redwood forests, and the Grand Canyon. New Exhibits in the Steamboat Museum! Steamboats.com now has a page dedicated to the model boat hobby. It includeslinks to everything about model boats on this site, plus all the model boatsites that used to be on the link pages. The model boat sites used to be mixedin with the buy or build real boat links, but now they are two separatecategories. To see model boats, click here.To see the link section for buy, sell, or build a real boat, click here. I also added several pages to Dave Thomson's wing of the museum. There are now nearlytwo hundred pages of historic steamboat photos and movie stills in Dave's collection.He has many hundreds of photos not yet posted, but this is a hobby, and Rome wasn'tbuilt in a day! The seven new pages begin here, click"next" at the bottom of each page to go to the next. We also added a YouTubedocumentary and more stills to Dave's page about the Newton, a paddlewheelerthat appeared in several movies, but tragically was destroyed in a fire duringits renovation. Another bunch of pages I reorganized are the stills from Steamboat Round the Bend.To see the whole movie synopsis and all the stills, click here. Apart from the Dave Thomson wing, I got out to see the little paddlewheel boats nearhere, and posted photos. See the Desert Belle on Saguaro Lake - click hereand the Dolly Steamboat on Canyon Lake - click here. Both of these boats are within aboutforty miles of where I live, but I just went to see them in the last month or two,go figure! There may be a steamboat near you, so check the Steamboats of the FiftyStates page (click here), which I recently updated because I wrote an articleabout it that was posted at Cruisemates.com (see article click here). Another page I updated this week is the model boat page of Virgil Reynolds, click here to see it.Well, that's all the news that's fit to print! Bookmark Steamboats.com and come back soon! Steamboats.com editorial comment: We need avision statement for getting the Delta Queen back out on the water.Even if it takes years, and even if it is just to let her run around near Chattanooga,giving dinner cruises. Once our vision is set, we will get ideas, and more people will come in to help.It is too sad to think of her just sitting there, docked.We must hold the vision of her getting around again.Many of us have a little candle of faith, but we have to put our heads together.What is wrong with discussing the subject, at least? My name is Carlton Jackson and I am a University Professor ofHistory,Emeritus, at Western Kentucky University. I am trying to reconstructtheInaugural journey of President-Elect Andrew Jackson, Jan.l9-Feb.ll,l829. He left the Hermitage aboard Steamboat Fairy on theCumberland,and took it all the way to Louisville on the Ohio, where he joinedSteamboat Pennsylvania to Pittsburgh, through Cincinatti andWheeling. Do you have any information about this very famous trip?I would deeply appreciate any and all information you might beable togive me on this matter; I know, for example, that the Captain of theFairy was Henry Harrison. I have reason to believe that theCaptain ofthe Pennsylvania was Kierstedt, but I can't confirm that. I wouldtrulyappreciate hearing from you.all the best. There must be many books on Old Hickory and would think that avenue wouldhave been explored previously. Prior to 1840 the documentation of steamboats must be pretty thin. Alan Bates (formerly First Mate on Belle of Louisville and designer of the modernNatchez at New Orleans and the General Jackson at Nashville) took over thehistory column in the WJ after Jim Swift passed on and Alan or again DeborahCribbs at the Mercantile might be good candidates if all else failed. I felt like a ghost from the past, as I walked aboard the Delta Queen Hotel in Chattanooga on July 17th. It was the first Reunion of former Delta Queen crewmembers, which was put together by former Pursers, Tracey Smith, Sharon Hirsch and Lindy Sanders. 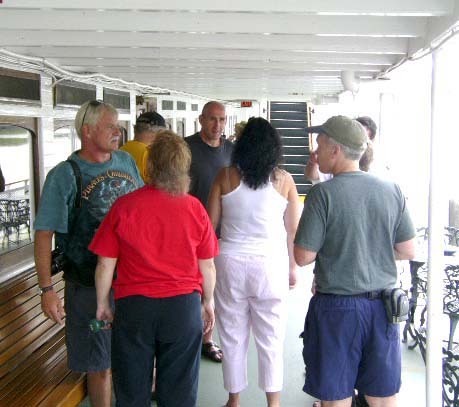 Most of these people were on the boat in the late seventies, eighties nineties, and up to 2008. The aging 81-year-old steamers final run was to Chattanooga in February. Captain Clarke Hawley and I were two of the younger crewmembers on the Delta Queen in the early sixties, so now; we are two of the older living crewmembers. I felt a little out of place when I first walked aboard, not knowing anyone. This changed quickly, as I immediately met new people and made new friends. We all have something in common, and it is our devoted love to a lady, a lady of elegance, grace and beauty, and the real lady of the River, the Delta Queen. She was our home for a while, and we got to know her, and all of us fell in love with her. We all came to Chattanooga to see her again, like she was our grandmother, or our great grandmother. We don't look at the Delta Queen as if she is a materialistic man made object, but we all look at her as if she is a living a breathing human being. She is now docked in Chattanooga as a floating Hotel. When you go aboard, you still see her Grand Staircase, the thick plush wall to wall carpet, the stained glass windows, and the rooms are as elegant as any fine hotel in America. The engine room is still intact, and breaths steam as it once did. The huge steam Lukenheimer whistle and Calliope still blows and plays, reminding you the boat is still alive. There were people from as far away as Tahoe and Las Vegas, New Orleans, Cincinnati, and St. Louis, Louisville and other parts, who came to spend a weekend on the Delta Queen. We all congregated in the Cabin deck, then to the Lounge on the Texas Deck, where we looked at picture scrapbooks from the past. We all reminisced about the good times on the boat, and told stories of our past experiences. There were three former Captains on the boat as well. Captain Paul P.T. Thoeny, Captain Mike Williams and Captain Kari Preston. The first night Harry Phillips, the owner of the boat, took us out on one of his sightseeing boats to tour the Tennessee River around downtown Chattanooga. On Saturday, we enjoyed a wonderful Bar-B-Q dinner, hosted by former Chief Purser Sharon Hirsch and her husband Phil. They moved from New Orleans after Katrina, and chose Jasper, Tennessee as their new home. Saturday afternoon, Captain Harry Phillips took us all out on his Fat Cat party boat and River Taxi, through the Chickamauga Dam and Lake for a five-hour cruise. This gave everyone an opportunity to share tales, and get better acquainted. The Reunion was a tremendous success. 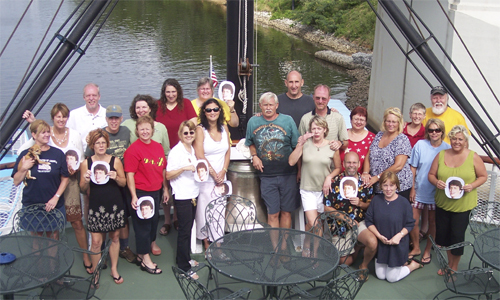 Crewmembers immediately started planning the second reunion on July 16-17-18th, 2010. 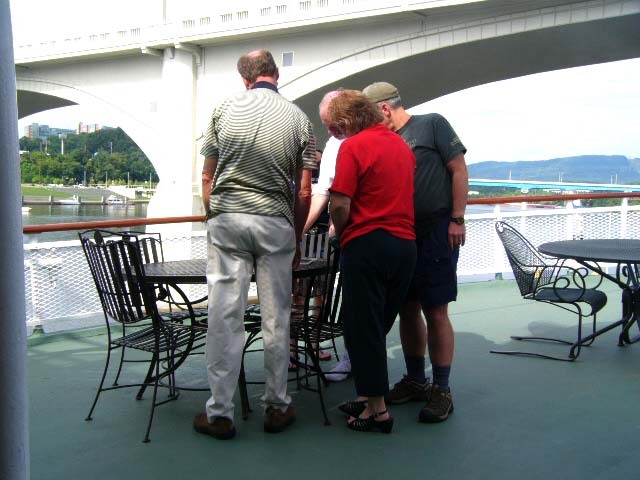 The Delta Queen is just a short walk from many eateries on the beautiful North Shore. We had dinner at the North Shore Bar and Grille on Friday and Saturday nights, and found the food and service to be most excellent. 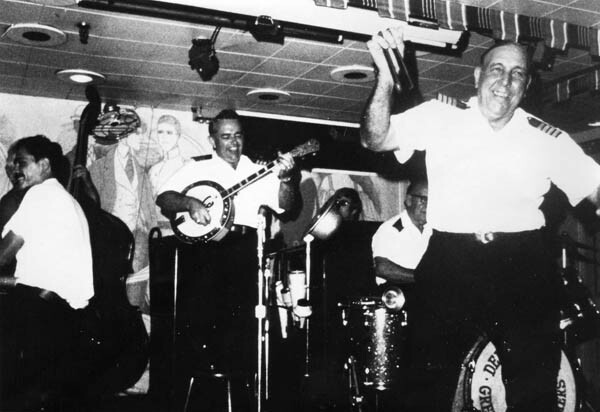 Captain Wagner on bones, Gabe Chengery on piano, Vic Tooker on piano, and Pop Tooker on drums.Photo sent by Ben Sandmel, photographer most probably wasJohn K. McLaughlin, a waiter on the DQ in 1973. Warner Bros. is now selling a DVD of the 1944 Frederic March "biopic"The Adventures of Mark Twain: seeWarner Bros. Official Online Storeput The Adventures of Mark Twain in the search window, top right. Just a quick note to say I love the model of the Thomas A. Edison on your site.My great grandfather was Captain Connie Menge. Can't wait to share the photos with my boys. message: I am looking for any information about the Jim Barkman steamboat, or any other boat that was burned on Bayou Bartholomew near Point Pleasant (Bastrop, LA) during the civil war. 06/04/2009 - The Delta Queen turned eight-two on Tuesday, congratulations.Also this week, the Delta Queen Hotel managers won their beer permit, sothe little old gal can host an onboard bar. Chattanooga hotel operators HarryPhillips and Sydney Slomeare still awaiting news from the U.S. Army Corps of Engineers regarding theirpermit to "permanently" moor the booat as a floating hotel. 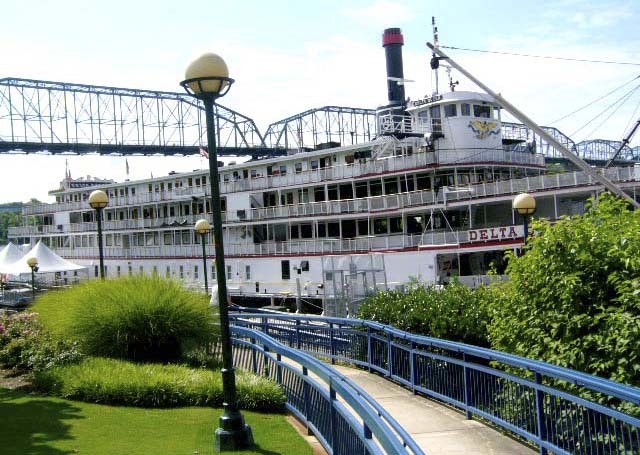 Save the Delta Queen news - we are waiting to hear about the letter writing campaignand whether the U.S. Army Corps of Engineers will take our thoughts into consideration.Click here to read some of the letters sent out.Meanwhile, other steamboat topics. Attention all former crew of the DQ, we are planning a party weekend on the good old DQ! We are planning a variety of activities including a Friday night mixer, a picnic in the park on Saturday and plenty of reminiscing, storytelling and alcohol drinking in the Texas Lounge. Bill Wiemuth and Laura Sable are working and will be providing the entertainment. They have also offered the option of the dinner/show on Friday night in the Orleans Room. The cost is $35.00 +tax and gratuity. It is a three course meal with a glass of wine included. If you are interested in attending the reunion, please contact me attsmith[at]sksins.com orthsmith[at]live.com. Please pass this information on to anyone you know who worked on the DQ. Party like a Steamboater :-) Steamboater Forever! Steamboats.com Editor's Note: Party like the boat will be back to traveling on the river soon.